For tens of millions of years, during the Carboniferous and early Permian, amphibia were top predators on land, especially in the low-lying tropical river systems. In drier conditions, they were less effective, and the ancestors of mammals and reptiles (the Synapsids and Sauropsids) gradually took over the land. They laid cleidoic eggs, which had hard shells, and could be laid out of water. Most of the early large amphibians went extinct in the Triassic period; a few survived to the Lower Cretaceous. A popular distinction is often made between frogs and toads on the basis of their appearance. Toads' warty skin is an adaptation for making their toxic slime. Apart from these glands, their skin is dry, and that is an adaptation to drier habitats. These features have evolved a number of times independently: convergent evolution. The distinction has no taxonomic basis. 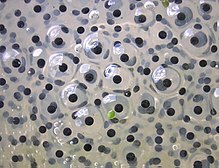 The only family exclusively given the common name "toad" is Bufonidae (the "true toads"), but many species from other families are commonly called "toads". ↑ 4.0 4.1 4.2 McCallum, M.L. (2007). "Amphibian decline or extinction? Current declines dwarf background extinction rate". Journal of Herpetology 41 (3): 483–491. 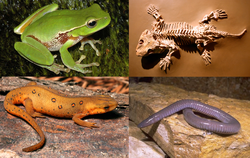 doi:10.1670/0022-1511(2007)41[483:ADOECD]2.0.CO;2. https://www.herpconbio.org/~herpconb/McCallum/amphibian%20extinctions.pdf. ↑ 14.0 14.1 14.2 Dumbacher J.P. et al (November 2004). "Melyrid beetles (Choresine): a putative source for the batrachotoxin alkaloids found in poison-dart frogs and toxic passerine birds". Proc. Natl. Acad. Sci. U.S.A. 101 (45): 15857–60. doi:10.1073/pnas.0407197101. PMC 528779. PMID 15520388. http://www.pnas.org/cgi/pmidlookup?view=long&pmid=15520388. ↑ 24.0 24.1 24.2 "Amphibian Conservation Action Plan". IUCN. Retrieved 2012-03-30.